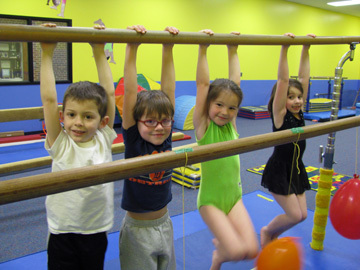 The Introductory Gymnastics program offers classes for young children to enhance large motor development in a gymnastic setting. Activities encourage coordination, balance strength and body/spatial awareness. At this level, the emphasis will be on developing self-confidence, building basic skills and having FUN! Classes are held in the Intro Gym (off the Commons Area Gym) at the Hartland Educational Support Service Center (former high school on M-59). The Parent-Tot class is a gym class for young children, walking through age three, with an accompanying adult also participating. Parents, grandparents or care providers are welcome and should dress comfortably for activity. Come and enjoy gym fun with your toddler! The Introductory Program includes **Advanced Gymnastics for those previously enrolled who meet certain skill requirements. Please click on the individual class levels to access the full schedule and shopping cart.